Sun Pacific is expanding its range of California-grown Mighties kiwifruit by introducing a 1lb clamshell of organic kiwifruit. The company claims the packs, which provide customers with enough fruit for a week, have yielded significant success in encouraging regular kiwifruit consumption, along with educating consumers about cutting and scooping the fruit for easy eating. Sun Pacific said sales of packaged kiwifruit grew 12.8 per cent last year, while bulk kiwifruit sales declined by 14.7 per cent. “As the largest kiwifruit grower in North America, we strongly feel it’s not only important to continue to find ways to increase kiwifruit consumption but it is imperative that we fill the need for consumer demand of organically grown fresh produce,” said Barney Evans, president of Sun Pacific. 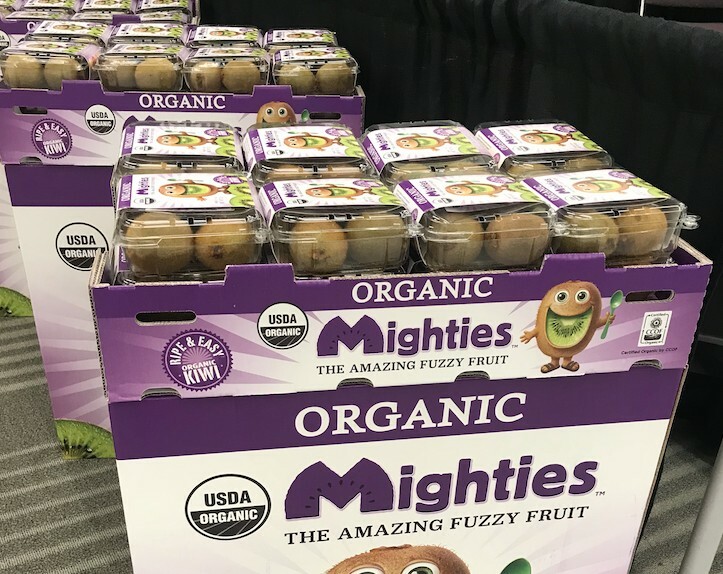 Since their debut at the Organic Produce Summit in July, the response to the Organic Mighties packs had been “overwhelmingly positive” according to Sun Pacific’s marketing director Kate Reeb. 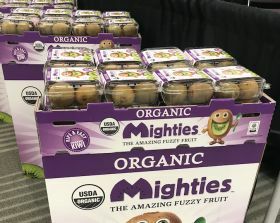 The new Organic Mighties packaging contains all the familiar design elements of conventional Mighties, with an eye-catching purple background instead of the traditional green background. Fuzzy, the brand’s official mascot, is featured prominently on the sleeve, while storytelling about how to eat kiwifruit and its health benefits will continue to be prominent as part of the packaging. Sun Pacific is also offering new in-store display shippers, which hold two cases each, and will also prominently display Fuzzy and the brand’s key graphics and messaging.